One of those acknowledged classics that really is every bit as great as its reputation suggests, Jean Renior's 1937 anti-war masterpiece is 75 years old this year, and to mark the occasion, Studiocanal are re-release the film in cinemas in April, followed shortly after by DVD and Blu-ray editions. Jean Renoir's La grande illusion is a poetic and poignant meditation on class, the nature of war and the death of the old European order. Aristocratic Captain de Boeldieu (Pierre Fresnay), mechanic Lieutenant Marechal (Jean Gabin) and wealthy Jewish banker Rosenthal (Marcel Dalio) are all thrown together, despite their vastly different backgrounds, as prisoners of the Germans in World War I. 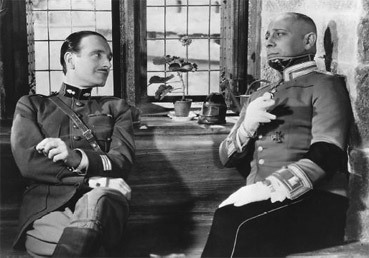 Separated by a successful escape, they are recaptured and reunited in an imposing fortress commanded by German aristocrat Van Rauffenstein (Erich Von Stroheim). Boeldieu and Rauffenstein strike up a friendship that reflects their belonging to a cultural and social elite that they both know is on the way out. However this rapport soon confuses loyalties and threatens Boeldieu's allegiances to the others, with tragic consequences. The title and central theme of La grande illusion comes from a Nobel prize-winning essay by a British economist named Norman Angell who theorised that the cause for war is usually the pursuit of wealth, but that ultimately war is never of benefit economically, and is therefore futile. The film calls on Renoir's own experiences as an aviator in WWI, and Jean Gabin even wears Renoir's uniform in the film. The film was declared the "Cinematographic Enemy Number One" by the Nazis after it won a prize at the Venice Film Festival and was banned. France soon also banned the film, fearing that the anti-war message would be demoralising for troops. The original negative was long feared destroyed in an Allied bombing raid on the laboratory where it was housed, though in reality it had been confiscated by the Nazis and shipped to Berlin to the Reichfilmarchiv. By chance this archive was situated in the Russian zone after the war and the negative thus found its way to Moscow. Despite being returned to France in the 1960s, the negative lay undamaged and unidentified in storage at La Cinémathèque de Toulouse until the 1990s. Having previously restored the film in 1997, Studiocanal and La Cinémathèque de Toulouse decided to complete a new restoration utilizing 21st century cutting-edge technologies. Scanning the original nitrate at 4k means that the film will be preserved now for at least a century. La grande illusion will be released in UK cinemas on April 6th, and then on DVD and blu-ray on April 23rd by Studiocanal. More details on the discs, including the pricing and extra features, will be confirmed at a later date.